Getting what you want out of life isn't necessarily a sign that God is pleased with you. Now a great herd of pigs was feeding there on the hillside, and they begged him, saying, “Send us to the pigs; let us enter them.” So he gave them permission. And the unclean spirits came out and entered the pigs; and the herd, numbering about two thousand, rushed down the steep bank into the sea and drowned in the sea. Jesus heard the requests of the demons and gave them exactly what they asked. I think we can safely say that Jesus was not happy with the demons nor was he "blessing" them. Getting what they wanted from Him was certainly not a sign that He was pleased with them. And they came to Jesus and saw the demon-possessed man, the one who had had the legion, sitting there, clothed and in his right mind, and they were afraid. And those who had seen it described to them what had happened to the demon-possessed man and to the pigs. And they began to beg Jesus to depart from their region. This time, Jesus heard the requests of the villagers and gave them exactly what they asked. Again, I think we can safely agree that sending Jesus away is not a good idea. Having Jesus abandon you is not a desirable outcome nor would we consider it a blessing. Getting what they wanted from Him was certainly not a sign that He was pleased with them. Here's the other side of this little equation. Not getting what you want out of life isn't necessarily a sign that God is angry with you. Having been healed by Jesus, the man wants to stay with Him and follow Him. Our natural inclination is to assume that this was a reasonable and honorable desire. Yet, this time, Jesus does not give Him what He wanted. However, we can see clearly that Jesus was not angry with the man. In fact, Jesus was entrusting the man with a great mission. Jesus had selected this man to be His representative in the Decapolis. Instead of being just another follower in the crowd, this man was one of the first people to ever receive a lifetime appointment to the mission field! He didn't get what he wanted, but he was given something far better. Therefore God gave them up in the lusts of their hearts to impurity, to the dishonoring of their bodies among themselves, because they exchanged the truth about God for a lie and worshiped and served the creature rather than the Creator... For this reason God gave them up to dishonorable passions...And since they did not see fit to acknowledge God, God gave them up to a debased mind to do what ought not to be done. Before you get jealous of your neighbor because they always seem to get what they want, remember that having our wishes granted isn't always the best thing for us. Sometimes it leads to a bunch of pigs falling off a cliff (a terrible waste of bacon!). And next time you aren't getting what you want out of life, it might be time to reconsider your desires. It is possible (probable) that God is simply protecting us from ourselves. Garth Brooks says it well, "Sometimes I thank God for unanswered prayer." 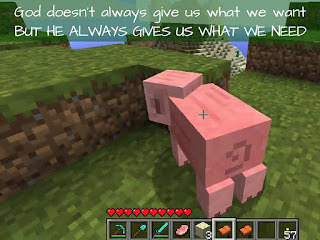 God doesn’t always give us what we want, but he always gives us what we need.